I’m excited to see what Switch: Change the World has to offer. I haven’t heard too much about it other than one person is playing two roles of a swindler and a lawyer. Really, I’m just happy that it isn’t another melo. 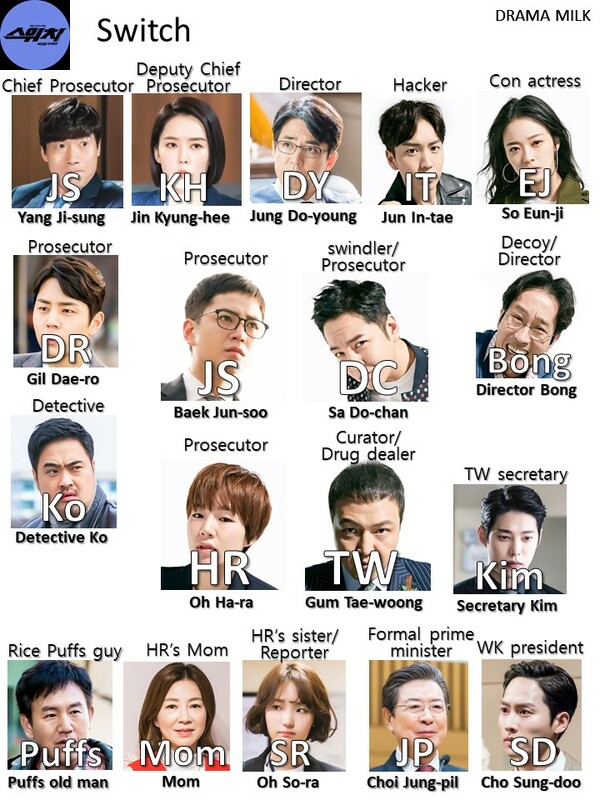 In fact, I think this is the only action show out right now, so hopefully it will bring something fresh to Dramaland. 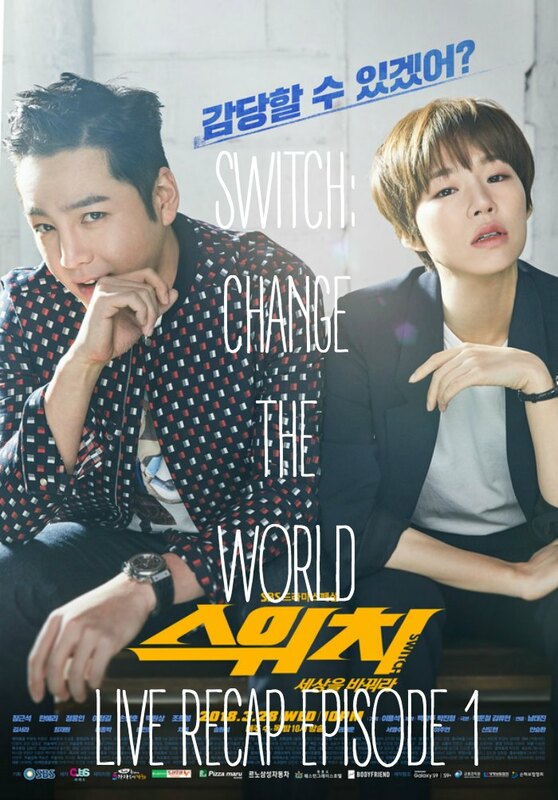 We have been looking forward to both Switch and My Ajusshi to air, so we aren’t sure which one we will put on the live recapping schedule and which will be an after cap. We’ll decide after the first two episodes of Switch airs today and tomorrow. For right now, Switch will be an aftercap. Wow, this drama opens very James Bond like with a lot of men on a boat traveling somewhere. there is an illegal gambling ring and these peole are off to stop it. Cut to the Gambling game. A lot of wealthy people are playing majang. One of them is the WK president, SD. JS says the prosecutor team is problemeatic, they only care about big cases, not swindlers, that is why I am here right. A man tells him yes! he says the prosecutor team is the problem. maybe he is the doppleganger DC? WK president loses all his money. But one of the other man thinks he cheated. he pulls out a gun on everyone. the prosecutors get to the building but aren’t let in. they say theya re prosecutors and have a report for illegal gambling. A gun shot goes off. JS asks, do rich people talk with guns? thy run inside. One of the men got shot with a gun. Everyone freaks out. then the man shoots again and the other man goes down. JS shows up in the room along with all the other prosecutors. He says this is illegal gabling and murder, arrest them all. One of the men treis to run away so JS yells to catch him! this man is about to hop off the ledge of one of the floor and makes it. He takes off running with his people and they hop on a boat. They got away. the prosecutor has to go back inside and tell them al that they left. JS says, they left? Okay, lets all wrap up and leave! Everyone in the building is a con man and they all cheer, lol. So this is DC, not JS. They were trying to get the WK president to leave and are all smiles that it worked. thy even joke about using a different gun next time. DC says swindling is short, but life is long. He gives the CHinese man money. JS is driving somewhere. He was talking to his chief on the phone. But then it looks like someone is trying to run him off the road. A car swerves and hits him head on which throws the car off the road and into the sea. JS tries to get out of the car. He manages to get out, the next task is to swim to the surface, but his head hurts. he keeps trying and gets to the surface. he crawl on the beach and passes out. We are introduced to our heorine, HR. there is a man with a knife. HR asks a man, if he swings a knife around, will she get scared? He attacks her but she defends her self easily and handcuffs him. She tells him to live nicely. then she gets a call from the chief. What?!? She runs to another building and asks for someone to open the door, she doesn’t have her ID. But the guard tells her to write down her ID. She hops over the gate and continues running inside. She gets to the chief and asks what happened to JS. The chief tells her that he was in a big car accident. He is in surgery right now. TW, the curator/drug dealer is in a museum explaining art to several women. Meanwhile HR tells the chief that she doesn’t think it was an accident. They go to the hospital and see JS hooked up to all the tubes and wires. They hope he won’t die. He is in a vegetative state. HR says she won’t let them get away with this, she will do something! They will report this to the director and the deputy chief. But HR thinks, it might be bad if they know he is alive. They should move him somewhere so no one knows he is alive. They move JH to another smaller hospital. the Chief of that hospital is JS’s friend, so he will keep things quiet. Meanwhile, TW is fishing. He thinks man and fish all want to survive. One of his thugs gives him a report on prosecutor JS. They found the body, but the door was opened so he might not be dead. TW says the biggest fish for a fisherman is the fish they didn’t get. HR calls one of the witnesses. But he only trusts Prosecutor Baek and won’t see or talk to anyone else. HR sighs. She tells the chief that this witness won’t talk to anyone else. The driver of the trucks ID is fake. then we cut to a house. It looks like it is the swindlers house. In the house, DC looks at JS’s ID. All his swindling people are there. They show him a video of this prosecutor that looks just like him. But DC says he doens’t want to be a prosecutor. He throws the ID into the fire place and stares at it as it burns. there is something strange going on, the prosecutors busted them, but they haven’t opened a case yet. Perhaps they were fooled? Find them! DC goes through the airport. An ajumma comes up to him and asks him for some money for her daughter in law. Can he give him this? She shows him some gold. His friends say that is fake. Bong says DC is doing it on purpose. that woman con artist is doing it for a living so he will give her some money. But then the thugs see him. DC asks this woman what she wants to tell him. She isn’t that great though. He gives her some money and tells her to practice harder. She nods and leaves and the thugs come up to him. SD says he tricked them. No one died and there was no prosecutor, something was strange. the man asks for his ID. But he burnt it. DC says he remembered it. You guys ran away. i am too busy with an investigation, i will find you later. SD says he lost 3 million dollars. He won’t just let it go like this. DC asks him if he thinks he can handle it? he calls one of his people and pretends like he is a prosecutor. He says he will take thoe guys that they lost at the island. He says a secret work so his team sneaks out and dresses like prosecutors. Their plan is to accidentally run into DC and say, ah, you caught those men? But they haven’t done that yet. that is only the plan. Right now, the thug is walking with DC and basically following him around. he wants to take his car. DC sees his team speeding off in front of them. They all drive to the prosecutors office and the thugs get out of the car with DC. He heads up the steps of the prosecutors office. DC is about to take the law exam, but Bong calls him and asks for him to save him. DC gets in the car and heads off to help Bong. In the present, DC calls his team, are they all set up? But they aren’t, they got into a car accident so it will take some more time. DC sighs but thinks of something to say. then he continues walking inside like he is a boss. DC starts talking to people in the office like he knows them. But the people he talks to are all like…..um……? He talks to a receptionist and she says someone is coming down now. DC turns back to the thugs and starts talking a lot of prosecutor stuff to them. they threatened a prosecutor and gambled so they re in big trouble. The thug is all like…..are you really a prosecutor? DC says he is, he is going to count to 3. But then someone yells his name and runs up to him. She hugs him and tells him that he is a littl efat, he gained some weight. it is nice to see him healthy. DC tries to pretend like he knows her and tells her that he has some guests. But the thugs run away. the friends show up to the prosecutor office, but they see the bad guys running away. EJ says their oppa succeeded again. Meanwhile, Oppa is in the elevator with HR. He thanks her so much. But then he says he has an appointment and will leave. But he doesn’t know where he is going. She tells him that is the mechanical room so he goes to the other room. But she tells him that room won’t open without an idea. She frisks him adn tells him that it is good to see him….Sa Do-chan. Cut to the two of them talking in another room. She tells him to think about the crime he did. She leaves, but DC is left wondering who this woman is and how she knows his name. Flahsback of HR looking for a lookalike. She finds DC’s image in a database and finds out that he is a super popular swindler, His IQ is 168, he is a super duper genius conman who does’t have a criminal record yet. She wants them to get him. But he came to her. We cut to her looking at DC from just a few minutes earlier when he was swindling those men on the first floor. She decides to run up to him and hug him. back in the interrogation room, the Chief and HR look at DC from behind the one way mirror. They wonder how he can look so similar. Dc starts talking and asks them to just open the door, he is kind of trapped in there. the chief tells her that, if something goes wrong then HR will be fired, he doens’t like it, but he tells her to take care of it. HR goes inside and talks to DC. Dc starts talking as if he is JS. He tells her she made a mistake. But she stands and tells him that he is a swindler that is pretending to be a prosecutor, does he want to go to jail? DC tells her that his heart races. She asks him if he is pretending to be a doctor now? DC just starts talking about simulations. Simulations are not true, but they also aren’t hidding the truth, so lets make a deas. Why did you take me as JS even tohugh you know I am not JS? HR says they can talk noe, she likes him because he is smart. Cut to the deal. DC doesn’t think it makes sense, she wants him to be a real prosecutor. She says she isn’t make him a real prosecutor, he should just pretend like he is JS. DC calls hre a swindleer also. But she says she doenst want him to do any swindling, he looks like JS so she wants him to do one job for her. He wants to know what will happen if i say no. She tells him she can call those thugs back. the scene changes to DC acting as JS. He is in the attire of JS and standing under a huge bridge somewhere. A man walks up to him. He says he heard that he was injured. DC says it was nothing. the man says he looks brighter than before. DS tells him that it was a big accident adn some people say that your personality changes when you have a big accident. the witness says the thing is in the Spanish center under DonQuixote. His friend knows the password. if you go there at the end of the day on Saturday, then my cousin will open it for you. I sent him your picture. DC goes back to the car and chats with the Chief and HR about waht might be inside….a diamond? Whatever the case, my job is over. HR asks the chief to call the hospital and ask about JS. it look slike JS will still be in the hospital past Saturday. So HR wants DC to work with them until Saturday, otherwise she will put him in jail. But he just leaves and says they don’t have any evidence that he conned anyone. Bring him a warrant. DC leaves, but then he returns. He says he wants to see Prosecutor JS with his own eyes and check to see if what they say is actually true. They go to the hospital and DC confirms it. He does look exactly like JS. HR asks him if he believes it now. She says they have a reason why they can’t tell anyone, but she can’t explain the details to him. DC says he will do it. He has a bit of sympathy for someone who looks just like him and is doing this work. DC wants to do the job though. he spins a Texas star/Cowboy star in his fingers and stops it. then he goes to meet with the chief and HR. they wonder how they can get inside. They can’t use a warrant or the word will spread. DC has friends but they aren’t sure about that. DC thinks they can make a situation where they can get in without a warrant if they make it into a crime scene. DC will go inside during the daytime and an actor can retend like he is a person who is angry at the reconstruction. he will protest a little and fight me. But then I can sees a bomb on one of the statues. If it makes a sound then the people will run away and the police team will come in. then we can find the evidence on accident. Like this. they think this is an idea that only a swindler can think of. But they are all on board. the chief wonders if HR can be responsible for something like that. HR says, if it is over my head then I will quit the prosecutor team. But the chief thinks she can do that becaue she is young. He has a daughter. And she wants to be a director. it is not actually about his daughter, he worries about HR. She will be fired and won’t be able to open her law office. Can I just not be apart of this? HR says, no. He is on the team. TW is at his desk and still looking for the witness. his thug says the witness is difficult to track. But they think Prosecutor Baek is dead so the Witness won’t be able to do anything. TW thinks it isn’t for sure that JS is dead, so they should offer the witness money. they need to find teh object and destroy it before the prosecutor team gets ahold of it. DC goes into the museum. One of the ladies has his photo and secretly gives him a 5 code. DC goes to the DonQuixote statue. He sees the code. Then he sees the protestor and smiles. he is about to go up to the protestor, but then a bunch of thugs show up and push the protestor out of the way. DC wants to know who there thugs are. They say that SD sent them, you are dead today. A huge fight breaks out. It actually turned into a legit crime scene and DC tries to fight off all these thugs. HR and the chief are in the car listening. DC tells them that the plan went wrong. HR and the chief hurry inside. The curator of the cultural center call the police just as HR gets inside. But then we see DC getting stabbed by one of the thugs. He bleeds from his belly and falls to the ground. HR and the chief are both shocked. The ambulance takes him away with a concerned HR watching. But then she thinks something is strange and goes inside. the piece they are looking for is gone. NO….it isn’t gone, it was just left open. Cut to the ambulance. DC is perfectly fine as we see his swindler team surrounding him in the car. Cut tback to the witness saying that he gave up 5million dollars because of him. That got DC’s attention. Then we see that DC hired those thugs. DC opens his bag and takes out a red box. He says that prosecutors don’t care about conman like them, becasue they only want to be promoted. HR opens the red box, but it is empty. She screams SA DO CHAN!!!!!!! DC has the real box and looks inside. Thanks so much for the recap! I haven’t had a chance to watch this drama. But after reading the recap, I think I will make time. It sounds fun! It is definitely worth checking out if you are looking for something that is fun and action packed.